The Norwegian Krone appreciates to the 9.71 region post-NB. The cross drops and tests fresh 4-day lows following steady NB. 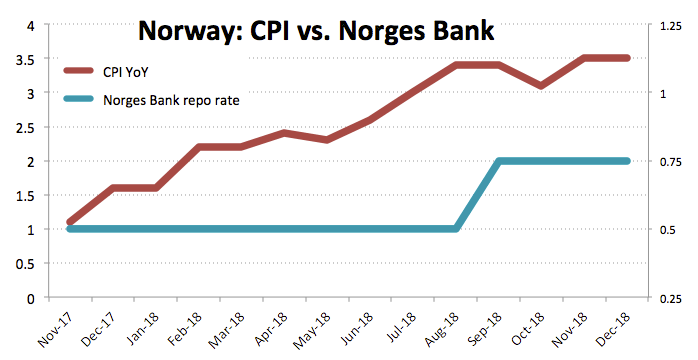 The Norges Bank left the repo rate unchanged at 0.75%, as expected. The Norwegian currency is gathering extra steam in the wake of the Norges Bank meeting on Thursday and is dragging EUR/NOK to fresh multi-day lows near 9.7100 the figure. The cross is down for the second session in a row on Thursday, coming under fresh downside pressure after the Norges Bank left intact its repo rate at 0.75% at today’s meeting, matching the broad consensus. The Scandinavian central bank stressed that domestic capacity utilization approaches normal levels while underlying inflation stays close to the bank’s 2% goal. In addition, the economic growth and labour market conditions remain within the bank’s projection. The Norges Bank also reiterated that it plans to raise rates in March amidst the continuation of the gradual tightening cycle. As of writing the cross is losing 0.34% at 9.7160 facing the next down barrier at 9.7107 (low Jan.24) seconded by 9.7062 (2019 high Jan.18) and then 9.6525 (100-day SMA). On the other hand, a break above 9.7817 (high Jan.23) would aim for 9.8077 (21-day SMA) and finally 9.8201 (high Jan.14).